Some of our younger visitors might not remember the discos from the 80s - crazy loud, tremendously fun, and filled with many things that, quite frankly, are better left unwritten. Whether you are a music aficionado or not, there are times in your life that you will have to share the room - and the music - with a bunch of other people. 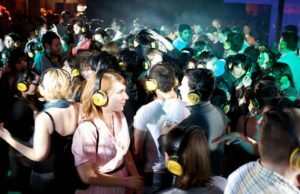 Here's why opting for a Silent Disco instead of a regular sound system could be the high point of your party. 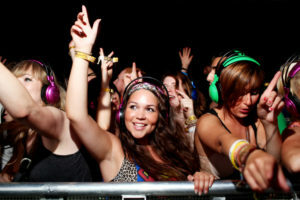 Silent Disco: Could this be the best fun ever? 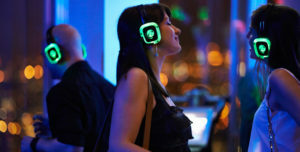 Wireless weddings & quiet clubbing with Silent Headphone Disco Ireland. You DJ… with our all new budget packages with a nationwide SILENT HEADPHONE delivery service by courier. When the band is finished up and the party DJ is just about to kick in, it’s time to hand out the silent wireless headsets to all your guests. Now the real fun begins as both music channels start up with two completely different musical styles at once. One is friendly chart music with some popular oldies thrown in and the other channel can be anything you like from club sounds to indi or drum & bass, it’s up to you. Continue reading Silent Disco: Could this be the best fun ever? Book a Silent Headphone Disco Kit Today! For the very fist time in Ireland, you can now book your own Silent Disco Kit and get it delivered direct to your door, stress-free. We provide a full range of Silent Hire packages, so if you’re looking for a dry hire service, just to rent the kit, BOOKA – Silent Disco is more than capable to suit your preferences and needs. Our concept is simple, to offer you the best direct prices on renting a silent disco system. We will courier direct to your door and provide the headphones, strong transmitters , linking cables to i-pads and mobiles and laptops spare new batteries. Continue reading Book a Silent Headphone Disco Kit Today!